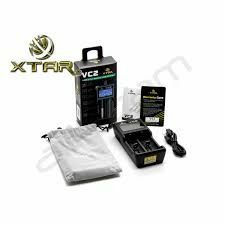 Recently I was approached by Xtar and was asked if I was interested in reviewing their new VC2 charger. Well I responded and told them I was interested and they sent me one free of charge (thank you Fany) for the purpose of review. For some reason, I was expecting the device to be shipped from the factory in China so I was very surprised to find it in my mailbox within a week from their warehouse in California. It turns out that they also have another warehouse in Florida as well. What I received was a small well padded package, containing the standard display box. Upon opening, I found the charger inside a soft cloth drawstring storage bag along with a standard USB/Micro charge cord and a small and well written instruction manual. 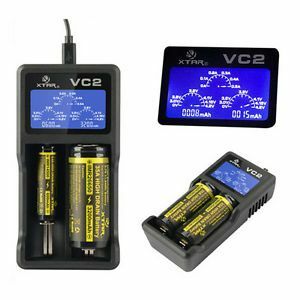 The VC2 charger is a compact two bay charger manufactured of a propitiatory ABS fireproof material capable of charging a wide range of Li-Ion batteries and offers short circuit and reverse polarity protection as well with each channel operating independently. The VC series also offers a 0 volt soft start that can rescue over discharged batteries as well as prolonging your battery life by avoiding a sudden high current inrush to the batteries being charged. The device will also tell you within 10 minutes if you have installed a battery that is no longer serviceable by indicating “Null” on the display. The device has a very sturdy well made feel to it and the battery slides operate very smoothly. One thing that really sets this device apart is what I consider to be a very innovative LCD display screen which I find to be very bright and very easy to read. Even without my glasses. As far as actually charging your batteries, very simple and straight forward. While you can connect the USB charging cord to your PC, I prefer to use an AC adapter or “Wall Wart” which is not included with the device. Not an issue as most vapers already have a few of these in a box somewhere and they can be purchased anywhere that sells electronics for around $5. Anyway, I set the charger down on my workbench and plug it in. The screen flashes, the display becomes visible and the “Dials” which are really reminiscent of the type you are used to seeing on the dashboard of your automobile set themselves to “0”. Anyway to start the test, I install a fairly new married pair of Sony VCT5s, 3.7v 2600mAh batteries. One reading 3.4v and the other at 3.5v which is normal for this pair and the device they are powering. Immediately after they have been installed in the charger, the bottom gauges which show you the actual real time charge level of the batteries go strait to 3.4/3.5 respectively. The top center gauge indicates a input charge of 0.5 Amps which is the max charging output for this device. It’s the one big drawback in my opinion. But also on each channel, underneath the charge level display, the mAh rating for each battery is slowly climbing from “0”. 6.5 hours later I get a nice surprise. I have a huge respect for battery safety and make it a point to never let my batteries charge unattended. And I am constantly keeping an eye on the charger so I can remove the batteries as soon as they are fully charged. Not to worry with the VC2 display. All of a sudden to my left from the top of my workbench, I have a bright blue flashing “Disco” light show going on courtesy of the VC2 display which is flashing on and off alternating with the word “Full” above one of the batteries. So I remove the fully charged battery only to have the show start over again in about a minute later when the other battery is showing “Full” as well. As I have mentioned before, on each channel their is also a readout of how many mAh hours have been added to the batteries during the charge process. And I was kind of confused at first that my 2600mAh batteries were only showing a little over 2500 mAh when they had been fully charged. So I reached out to my contact at Xtar and asked Fany about it. She informed me that this was normal on any battery that had a level of greater than 2.0v when the charge cycle was started. And when you have a battery in good condition at 2.0v and charge it, the mAh reading should come close to reflecting the actual full mAh rating of the battery in question. I am thinking that I want to check that out for myself. I normally use regulated devices that shut off right around 3.4v. So I go digging around in my collection and find a IMR,3.7v 1600 mAh battery which I very, very carefully discharged down to 3.0v which was the lowest I was willing to attempt and put it in the VC2. The process began just as before and the real time charge gauge read right at 3.0v and started charging at 0.5 Amps. Time passes and once again 3 hours later, the light show starts again, the battery shows it is fully charged to 4.2v and the mAh reading is right at 1500 mAh. Again, 100 mAh less than the rating but like I said, I did start at 3.0v and not 2.0v. I am also willing to accept that the Xtar chargers can indeed repair and charge an over discharged battery as a few months ago, I needed an 18350 cell and the one I found was rather on the old side if barely used and it was reading at 1.68v. And I charged it (keeping my eyes on it the whole time and it did charge the battery to 4.2v and it performed as it should in the device I was using. In addition to the above, I also charged the same pair of batteries from the original test on another manufacturers charger that I had received as a Christmas gift. When the charge cycle was complete, I installed them in the VC2 and while the charge still showed to be at 4.2v, the VC2 started to charge them and added, according to the gauge, another 1 plus mAh hour to them over about 30 minutes. With the obvious drawback of the maximum charging output of 0.50 amp, I really like this little charger even if it takes FOREVER to charge a pair of 18650 batteries. But charge them it does, slowly and safely. And it is a perfect size to pack with the rest of your gear when you travel. And looking toward the future, Xtar has now come out with a 4 bay charger with the same features that offers a full 1.0 amp charging current in addition to the 0.50 amp charging option that I hope to be reviewing for you soon as well. And charge your batteries Well! PREVIOUS POST Previous post: Have critics finally admitted defeat in banning electronic cigarettes?